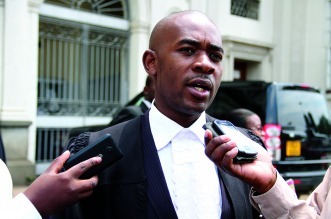 MDC Alliance leader, Nelson Chamisa is sending emissaries to South Africa and Angola in his regional diplomatic offensive aimed at pushing President Emmerson Mnangagwa’s government and the Zimbabwe Electoral Commission (Zec) to bow to his demands for free, fair and credible elections. The alliance will by the end of next week dispatch three of its principals Tendai Biti, Welshman Ncube and MDC-T secretary general, Douglas Mwonzora to raise red flags in what they have termed electoral violations. Chamisa’s chief election agent Jameson Timba, told NewsDay that Chamisa has already reached out to President Cyril Ramaphosa of South Africa, who is the chairperson of Sadc, and Angolan President João Manuel Gonçalves Lourenço. “We have written to the host nations which are South Africa and Angola being our first ports of call because of the strategic positions that they hold. President Chamisa will despatch his top team by next week to go and appraise them over what is happening in Zimbabwe,” he said. Chamisa was unhappy with the manner in which Zec was handling the elections, accusing the electoral body of taking sides with Zanu PF. The MDC Alliance said given the boiling tempers and a stalemate on the printing of ballot papers, Sadc and AU should take over the running of the polls. The diplomatic offensive is meant to persuade the regional block to step in and bring sanity ahead of the watershed general elections. Timba said following the demonstration by the MDC Alliance, they were still waiting for a response from Zec. Mnangagwa, speaking in Beitbridge on Wednesday, said he was not worried over small parties that were afraid of elections. Meanwhile, Chamisa yesterday scoffed at the 22% pay hike for soldiers as peanuts. Speaking at a rally at Gaza Stadium in Chipinge, Chamisa said civil servants deserved better salaries. “Soldiers, police officers and teachers were given pay rise and its peanuts. Under my government they are going to benefit more. Zimbabwe is going to be a different country come August 1,” he said. Sifiso Sithole, daughter of nationalist and the late Zanu Ndonga leader, Ndabaningi Sithole said her father died a disappointed man. Sifiso (64) who received a rousing welcome at Gaza Stadium, told NewsDay on the side-lines of MDC-Alliance star rally that her father left the unfinished business of removing Zanu PF from power. She claimed Chamisa was anointed by God. “I am happy that our president Nelson Chamisa is God-fearing. He is a pastor and that tells you that he is a good leader,” Sifiso said.